This weekend, temperatures are expected to drop a bit as winds increase, according to the National Weather Service. The forecast includes an air-quality alert, a wind advisory and a red-flag warning. Today is sunny with a high expected to reach 106, triggering a heat watch. 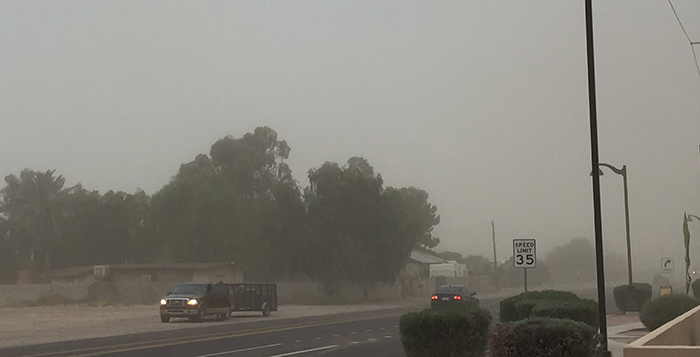 Pinal County Department of Air Quality issued an “airborne coarse particle high pollution advisory” as blowing dust and winds increase overnight. The nighttime low is expected to be around 68, with winds 5-15 mph and gusting as high as 20 mph. Friday, look for blowing dust from 11 a.m. to 11 p.m. in an otherwise clear day. The high is forecast to be near 101. Winds will increase from 5-15 mph to 15-25 mph and gust as high as 35 mph. The wind advisory will be in effect from 2 p.m. to 8 p.m., indicating possible hazardous driving conditions for high-profile vehicles. It is also a day of red-flag warning, any fires can spread quickly. The low will be around 66 in a windy night. Saturday will be sunny with high near 93 degrees. Winds are expected to be 10-20 mph with gusts as high as 30 mph. The overnight low will be around 61 with continuing windy conditions. Sunday, Mother’s Day, will likely be sunny with a high near 92. The winds will ease to 5-15 mph with gusts of 20 mph. The nighttime low again will be around 61. That will lead into a typical Maricopa mid-spring week of sun and high 90s and low 100s.